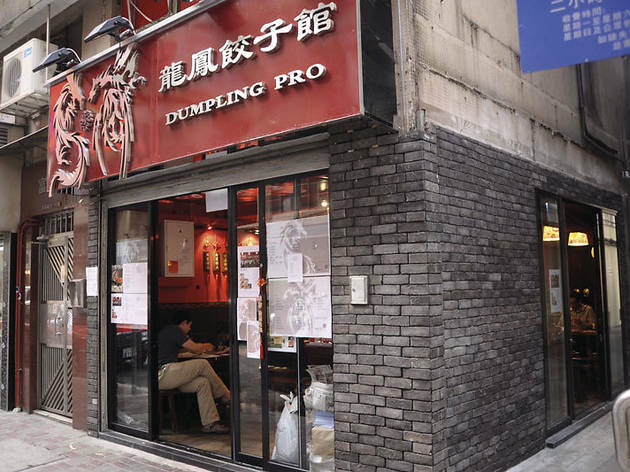 New to the Wan Chai dining scene is Dumpling Pro, a Chinese joint peddling the sort of meat and carb-heavy menu meant for hulking labourers in China’s cold northeastern stretches. the names of their best-selling items are also carved on small wooden plaques and displayed around the restaurant walls. 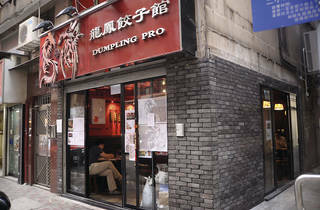 As the name suggests, the restaurant’s fresh dumplings are the biggest draw. These two-bite parcels are made fresh to order, wrapped and steamed in an impressively glossy, thin skin with a light floury fragrance and slight chewiness. We ordered our first round of hand-kneaded dumplings filled with the standard combination of minced pork and Chinese celery and served in soup with noodles ($34/eight dumplings). The wrapper-to-filling ratio was spot on, allowing the subtle sweetness of the fresh pork to shine through in every bite. Second up were vegetarian dumplings filled with diced vermicelli, water chestnuts and bamboo shoots ($32/ten). The crunchy combination made for an interesting parcel that was surprisingly filling for a meatless dish, especially when devoured with a swipe of black vinegar. Our hands-down favourites, though, were the dumplings fattened with pork, whole prawns and chopped Chinese chives ($35/ten), which imparted a much-needed natural pungency to the otherwise mild tasting filling. We rounded off the carb-fest with a big bowl of handmade wheat noodles slopped with tomato sauce and eggs ($32). The thick, Northeastern-style noodles looked like strands of Japanese udon but without the slipperiness and body to properly hold up the sauce. The soppy, soft texture of the noodles also left us feeling unimpressed, especially as a follow-up to the dumplings. What did excite us was the sauce, which was made with fresh tomatoes. At first the flavours seemed bland and uninspiring, but the broth-like sauce impressed more with every increasing sip. Made without the addition of MSG, the sauce’s clean, natural flavours remained fortifying to the last drop. We only wish the accompanying noodles had done the sauce more justice. Dumpling Pro focuses on drawing out natural flavours out of simple ingredients. If you’re looking for dishes prepared with rich and robust seasoning, we’d recommend you head elsewhere. But if you’re looking for fresh, soothing and filling fare, this is a good neighbourhood joint to check out.